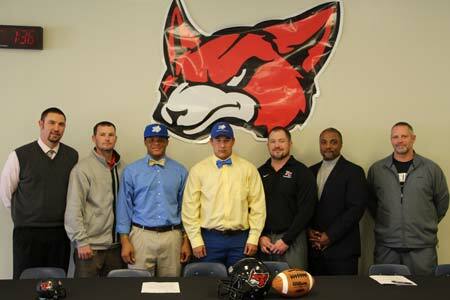 Fox Creek High School’s Deondre Baskett (left) and Ty Yarbrough (right) signed national letters of intent to play football for Limestone College last Wednesday. Joining the two new Saints for the signing were members of the Fox Creek administration and coaching staff. Limestone will play its first games during the 2014 season after announcing the addition of football to their athletic programs in the fall of 2012. With the addition, Limestone becomes the 168th Division II institution to offer football and increases the number of athletic teams to 25, a number which ranks among the top five largest programs in the division. Among their peers, the Saints become just the fourth Division II school in South Carolina to offer football, joining North Greenville, Newberry and Benedict.